Every month we share with you a story about how children are using their KiDs Beach Club® Explorer’s Study Bibles. We know the Bibles are being used throughout the school year, but what happens when the Beach Clubs break for the summer? This month we wanted to share two stories about the impact the KBC Bibles are having on children this time of the year. That same day, when a volunteer walked in to the school office to sign in, a parent there recognized the KBC t-shirt and began to apologize. She was filling out a KBC permission form for her child who stood beside her. With a huge smile on her face and a chuckle in her voice the volunteer assured the mom that they would love for him to enroll and come even if it was the last day. The young man had a great time and even had his ticket drawn for a t-shirt. Most importantly, he left with a KBC Bible to carry the Word of God with him until he rejoins the group in the fall. The other story is about a young woman who is armed with her KBC Bible as she moves to a new state, motivated to learn scripture. When students in one Surf Team began reciting John 3:16 from memory earlier this year, one girl was feeling left out. She later went to her Surf Team leader and expressed that she seemed to be the only one that didn’t know that scripture. Realizing that it must be important and that she, too, wanted to be able to recite it, she asked her Surf Team leader to find and highlight the verse in her KBC Bible. She shared that she was moving to California and would not be able to attend Beach Club anymore; but that once she got to California she would work to learn that verse so that she too could recite it like her classmates. These children, on two very different paths, can rely on their KBC Bibles to help illuminate their journeys. 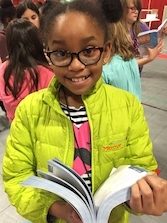 Thank you for your continued support as we connect KiDs to Christ and put Bibles in their hands.